69305g, CENTER CAP USED, 86-94 TOYOTA, 4 RUNNER, P/U, PLASTIC, 6 SMALL RIVETS, BLACK CENTER, RED WORDS AUTOMATIC DISCONNECTING DIFFERENTIAL, 5"
69305g, CENTER CAP USED, 86-94, TOYOTA, 4 RUNNER, P/U, BLACK PLASTIC WITH 6 SMALL RIVETS & BLACK CENTER & RED WORDS AUTOMATIC DISCONNECTING DIFFERENTIAL ON EMBLEM, 6 LUG NUTS CUT OUT, 6 METAL CLIPS, 5" DIA. 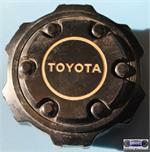 69305h, CENTER CAP USED, 86-94, TOYOTA, BLACK PLASTIC, 6 SMALL RIVETS. GOLD OUTLINED WORD TOYOTA, 6 LUG NUTS CUTOUTS, 5" DIA.